In our last two blogs, we have focused on a total of 10 different tips for how to improve your balance and prevent falls. Today is the 10th annual Falls Prevention Awareness Day by the National Council on Aging, and in honor of that, we’d like to conclude this 3-part series with a look at how the right exercise program can help you to avoid falls. In part 2 of this series, we looked at some of the ways that you can stimulate your brain’s ability to keep you in balance. However, no matter how much your brain might want to keep your balance, if you don’t have the muscle tone to match, the sharpest brain in the world won’t have much to work with. Your ability to keep your body upright and balanced depends on a combined effort between your ankles, knees, hips, core muscles, reflexes, eyesight, and inner ear equilibrium. Aging leads to a certain amount of natural deterioration of each of these individual components, leaving you at risk of a higher likelihood of falling. However, you are not completely at the mercy of your body’s whims. For many people, an exercise program is not only possible, it forms a vital part of your ability to prevent falls. The best exercise routine for seniors is one that takes into account your unique needs and gives you a workout that is easy enough to not be daunting, yet hard enough to make a difference. There’s an unbelievable number of muscles that are at work in every part of your body at any given moment. It’s not just strong glutes or quads that keep you in balance. It’s a combination of all the tiny muscles surrounding the joints of your hips, knees, and ankles that are constantly sensing the environment around them and making micro-adjustments to keep you stable and upright. It’s also thanks to your core muscles, the deep abdominal muscles that you may not even notice or appreciate until they let you know they’re not strong any more. The right exercise program will build your strength in all the areas that are important for your balance. Your fitness routine doesn’t just make you stronger; it also limbers you up and increases your flexibility. Have you ever noticed that when you’re stiff, you don’t let your limbs move as far as they used to? Watch a young child attempt to balance as they walk on a narrow beam or a railroad track, and you’ll see their arms flying out to the side as they involuntarily attempt to catch their balance. If your range of motion is limited, you won’t be able to immediately counterbalance yourself if you start to fall. Therefore, your exercise program should also help you to do what you can to improve your flexibility. 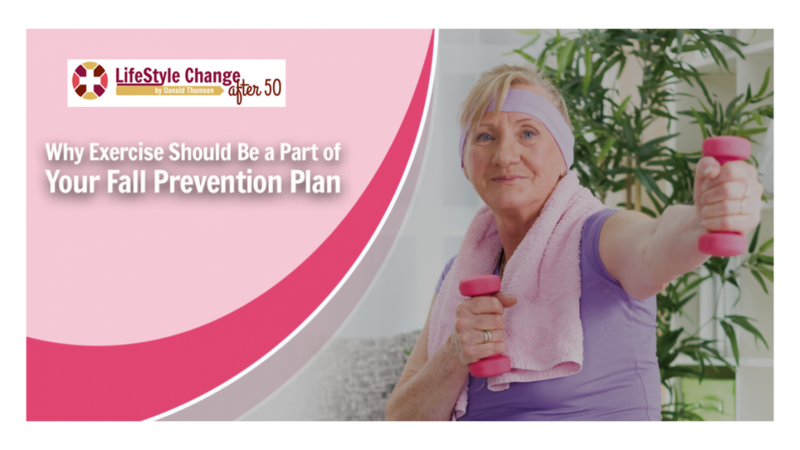 The exercise program for seniors here at Lifestyle Change at 75 is just what you need. This video series was developed by seniors, for seniors, and you can get a free sample of the content when you sign up here. Join us in the quest for fall prevention, fitness, energy, and overall health.